I don’t know what it is about Tuesday, but oh boy. Tuesday. Awkwardly stuck between spanking-fresh, bright-eyed Monday, with its green juices and resolutions, and naive, hopeful Wednesday, the first sneaky drink of a long week – Tuesday always manages to be the longest, grimmest day of the week. Tuesday is the day when you miss your bus by a handful of seconds and are left waiting in the rain for the longest fifteen minutes of your life.On a Tuesday you will systematically realise you have run out of the very thing you crave the most when it’s too late to go and buy some more. Having to stay late at work? That also seems to always happen on a Tuesday. Tuesday food needs to fulfil a number of criteria. It needs to be nice, tasty, if a little indulgent. It also needs to be quick and so easy you can be catching up on Jane The Virgin while the food does its thing. It needs to be the kind of simple food that seems to just sort itself out while you finally sink in your more-beautiful-than-ever sofa (Tuesday really makes you appreciate sofas). Enokis are funny little things, clusters of fragile, skinny mushrooms, bizarrely wonky and pale, and absolutely delicious. Roasted with some velvety, all-powerful butter and sharp soy sauce, they become an indulgent treat to be eaten straight out of the foil. I’ll admit that enoki mushrooms are not the easiset thing to find, but most Oriental supermarkets will stock them, as well as Whole Foods and Planet Organic, and they keep quite well in the fridge. They also seem to soak up flavours beautifully, so you could add them to any stir fry. Or you could just roast them with butter and soy sauce. If you didn’t know soy sauce and butter was a thing, well, neither did I. But this New York Times article convinced me to give it a try – also, stay tuned for some instant ramen with butter, soy and American cheese, but that’s for a Friday. Now, for our soy sauce butter roasted enoki, which may technically be a side but I mean, what’s the difference between a side and a main, except for quantity? I normally have this alongside some simple, perfect fluffy white rice, steamed beyond any nutricional value (it’s ok, I had a green smoothie on Monday). Pre-heat the over to the maximum (for me, it was 250°C). 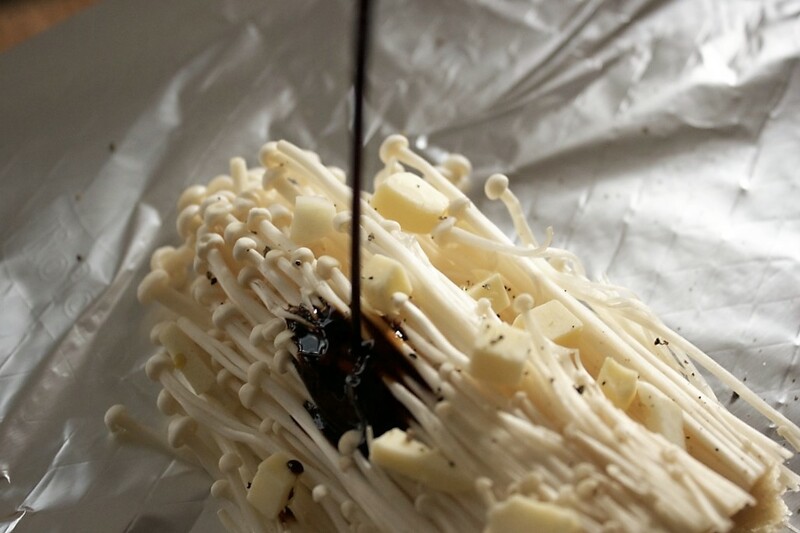 Wash the mushrooms and trim off the woody part at the bottom.Wrap in foil and add lashings of butter, some soy sauce and a little pepper for depth of flavour – you could add a lemon wedge for balance. Roast for 15-30 minutes depending on desired texture.